There is nothing better than relaxing and sharing a movie with friends and family and with over 20 years experience in bespoke Home Cinema this enables us to create a cinema experience in your home within your budget. 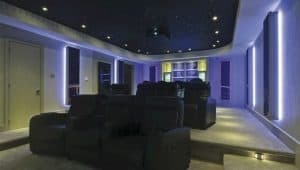 If you are looking for a custom designed dedicated home theatre, a discrete hidden cinema in your lounge or even a cinema in your garden we offer a comprehensive service offering all the up to date technologies from the market leaders. If you would like to discuss your home cinema further and if you’d like our advice to help you get the best installation for your budget, please call us on 01277 890 888 or 020 7454 1234 or email sales@rococosystems.com .